The practice of giving present value to past objects is the main focus of my current research. Through a selective accumulation of material I study the cultural and social ramifications of using a nostalgic method of production. 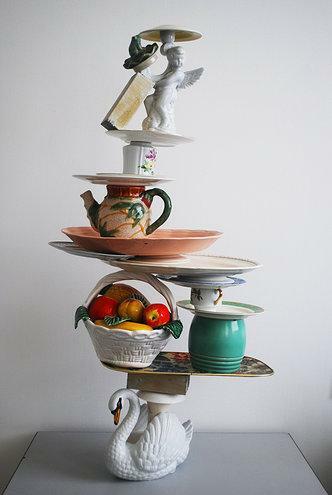 Primarily using the bizarre and kitsch aesthetic of dated decorative objects, I intend to amplify the relational discourses produced by ordering and joining the objects in the form of autonomous structural sculptures. Parallel to this physical study, I am currently exploring the theoretical process of referencing past knowledge, allowing a comprehensive investigation into the fragmented nature of presenting the past through contemporary culture. Theoretical exploration into the appropriation of the past within present culture has prompted research into the concept of the archive and its’ potential for reference in future production. As a result of a ‘compulsive, repetitive and nostalgic desire for the archive’  vast amounts of material has been documented through a longing for the comfort of the fixed residues of the past as opposed to the unknown future. On some level the selective nature of nostalgia can be utilized as a process within the method of bricolage, often executed to form present physical and discursive culture. Claude Levi- Strauss  describes the Bricoleur as building a ‘treasury’ composed of ‘heterogeneous’ objects which he strives to define as part of a new set. By selectively referencing the favoured aspects of the past and presenting the pieces within a new structure, these fragments are given a contemporary value. Through my work I wish to explore this growing desire to connect with the past and examine what it suggests about our attitude towards present circumstances. In the process of creating my sculptures the selective collection of objects is important. As a resource; car boot sales, markets, charity and junk shops serve similarly to the archive as they bring antiquated objects into one place where they are scrutinised and accessed. Within my practice I can continue this referential recycling of the past, by giving a new physical purpose to each piece. As with the process of nostalgic selection, I take an intuitive approach to choosing my material. I prefer to use decorative objects, as their intended purpose represents a subjective value rather than a functional purpose, questioning emotional, intellectual, cultural, social and aesthetic choices. In order to be found in their present environment these objects have now been discarded, potentially losing their original sentimental value. By making use of these objects to build my sculptures in a ‘compulsive, repetitive’ construction of accumulated objects, my work offers a playful present value and a new cultural platform for the pieces to be collectively found. Derrida, J (1998). Archive Fever. Chicago: University of Chicago Press. Orchestrated - group exhibition, Studio One Gallery, London. Sculpture exhibition – Construction Gallery, London. The Pavo Immortales Festival – joint exhibition with Katherine Anderton - Reading University Central Gallery. F*ck Function: Fashionality – group exhibition - Reading University Central Gallery.